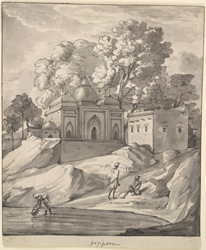 Pen-and-ink and wash drawing, by Henry Salt (1780-1827), of a mosque on the river bank at Ghazipur in Uttar Pradesh, dated 14th September 1803. This drawing is inscribed on the front in ink: 'Gazipore'; and in pencil: '23'. Viscount Valentia (George Annesley) wrote, "September 14.-This was a hotter day than any we had experienced. About four in the evening we passed Gazypore, where are cantonments for three regiments of cavalry, and at the end of the town a palace of the Nawaub of Oude overhanging the river, which was now wide, and the current so slow, that we have made but sixteen coss in fourteen hours."